Dignified, noble, loyal—the English Mastiff is a gentle giant who wants nothing more than to be near his family. A Mastiff is likely to want to cuddle and rest his head on your lap rather than sleep in his own bed. The loving Mastiff is a wonderful family companion for households with older kids, though his gargantuan build may be intimidating for some. Though gentle and trainable, the Mastiff isn't ideal for a first-time dog owner as the stubborn nature and large size of a Mastiff can be a difficult combination without early and continued training by a consistent owner. A friendly, steadfast dog with a calm demeanor is the great reward for persistence during training. The Mastiff is also known as the English Mastiff or Old English Mastiff and may be referred to as Mastie. Coat - Mastiffs possess a short, coarse topcoat with a dense undercoat. No fringe should be present. They may be apricot, brindle, or fawn in color, and a dark—often black—mask must be present at the muzzle, eyes, and ears. The ancient molosser—a large dog type originally from Asia—is considered to be the ancestor of the Mastiff. These giant, muscular dogs were likely used as fighting dogs in ancient Rome. Records show that the Mastiff-type dog may have accompanied Caesar when he invaded Britain in 55 BC. The English kept Mastiffs to protect their farms, livestock, and homes, and as hunting companions. A list of dog breed names published in 1465 in The Book of Saint Albans listed the Mastiff in a section about hunting dogs. The ancestors of Mastiffs were used in bull baiting and dog fighting, but when the Cruelty to Animals Act banned the sport in 1835, the Mastiff saw a decline in popularity. Mastiffs nearly went extinct, but the breed was reimagined as a good-natured pet and bred for this purpose. There was another sharp decline in the Mastiff's population during World War II due to rationing. Families couldn't afford to feed the giant breed, so the population dwindled to a mere 14 dogs. Every Mastiff living today is descended from those 14 dogs. The current Mastiff Club of America was founded in 1927 and the Mastiff was recognized by the AKC in 1885. The dignified and docile Mastiff is a loyal breed known for his protective nature. While generally friendly and easygoing, he may be standoffish or suspicious of strangers. Mastiffs can be stubborn or strong-willed and need consistent, positive training throughout their lifetime. Mastiffs may be sensitive to harsh punishment, abrupt changes, strangers, and new situations. Early socialization is necessary to prevent undesirable or aggressive behaviors. Are Mastiffs Good with Kids? A good nature and friendly demeanor are qualities of the Mastiff breed. Though they are usually gentle and tolerant of children, they are massive dogs and may not be a match for kids with no dog experience. They spend a good portion of time trying to sit or lean on their people to show affection. They may knock over a child with their huge body or happy, wagging tail. 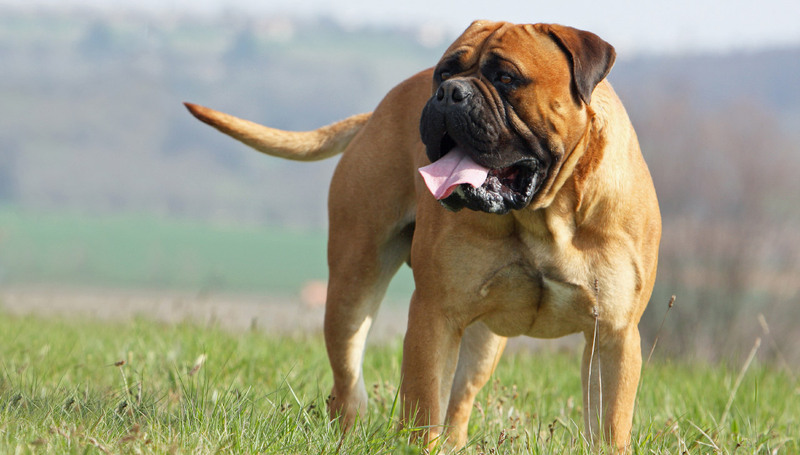 Though the breed is large and sturdy, children should never be allowed to climb or ride on a Mastiff or any other breed, as it may injure the dog or instigate a bite. Are Mastiffs Good with Other Pets? Some Mastiffs can live with other dogs, while others may be territorial and thus make a poor match for other dogs. A male Mastiff is more likely to get along with a female rather than with another male. Introductions should be made slowly and with supervision. A Mastiff may be able to live with dog-experienced cats, but the breed may display a high prey drive that prevents peaceful coexistence. While the Mastiff is a loyal breed, encouraging protective behaviors as a guard dog can be detrimental to his overall behavior. Mastiffs need regular socialization and it is not recommended to promote threatening or guarding behaviors. The breed's gigantic bark is often enough to discourage would-be thieves. Inciting guard dog behaviors may be a dangerous choice due to the Mastiff's already-territorial tendencies. Though the Mastiff is a large dog, his energy level isn't impressive. He makes a calm and quiet companion and enjoys spending time snoozing indoors, but still needs the opportunity to run and play. Indoor The Mastiff is a massive dog, but may live in a smaller home if given plenty of time to exercise outdoors. Without enough exercise, Mastiffs may become bored and destructive. A home in the country is ideal for the Mastiff due to his large size and tendency toward territorial behavior and nervousness around strangers. Landlords may not accept a Mastiff, as some insurance companies will not insure properties with Mastiffs in residence. Outdoor While the Mastiff is a sturdy dog who enjoys going outside with his family, he is not meant to live outdoors full time. This social breed desires time near people and a soft bed for sleep. Mastiffs do not tolerate heat and should not be expected to stay outdoors in hot weather for long periods of time. While they aren't likely to wander, they may be territorial—a fenced yard may be necessary. Exercise Half an hour to 40 minutes of exercise per day, split between two walks, is plenty for the Mastiff. While he is large, does not require excessive exercise. Small bursts of activity will keep him happy, but he is not made to run long distances. Time to roam in a fenced yard and short walks together will provide enough exercise for this couch potato. Endurance Mastiffs would prefer to relax at home rather than participate in strenuous activity. You may need to offer nudges in order to get this breed outdoors to exercise. They do not have high endurance, as too much activity can bother their joints, and they are prone to overheating. Running Miles: Healthy, well-conditioned Mastiffs may be able to manage up to three miles at a moderate jog, but they are not built to run long distances. Regular breaks may be necessary to prevent overheating. Hiking Miles: Hiking can be a pleasurable activity for a motivated Mastiff, but it is important to keep an eye on him to ensure he does not overheat. A hike of fewer than five miles may be possible. Hiking should not begin until a Mastiff is fully grown, around 18 months to two years old. Territorial behaviors may occur on the trail, so proper socialization is imperative prior to hiking. Food The Mastiff is prone to gastric dilatation volvulus or bloat. The general recommendation for how much high-quality dry dog food (based on average weight and activity level) to feed is six to eight cups of food per day, more for larger examples of the breed. This amount should always be split between two or three meals per day, and be given after exercise rather than beforehand to prevent bloat. Mastiffs do not tend to guard their food, but children should never be allowed to touch or remove food while any dog is eating. Alone Time While happy to relax on a couch for long periods of time, the Mastiff is a social breed who requires plenty of attention throughout the day. A Mastiff would rather nap near his people, and he will likely attempt to rest his head in your lap while you sit together. If left alone for long periods of time, the Mastiff may become destructive and chew furniture or other belongings. Training a Mastiff to use a crate may be helpful in preventing these destructive behaviors. Though the Mastiff has a short coat, he sheds year round. Daily or weekly brushing will cut down on stray hair, and you can bathe him as necessary. You may need to wipe a Mastiff's eyes and face daily to prevent infection. Trimming nails regularly will help prevent painful splitting, cracking, or breaking—early introduction to nail trimming is necessary to prevent any aversion to having his paws touched. Mastiffs require regular ear cleaning to prevent ear infections. You can minimize serious health concerns in a Mastiff by purchasing him from a reputable breeder who engages in responsible breeding practices, and through screening for common diseases and conditions. While the Mastiff responds well to basic obedience training, he may be stubborn or unmotivated to learn and follow the rules. Short training sessions are ideal to keep the Mastiff's attention. Early training, including socialization with people and other dogs, is necessary to prevent undesirable behaviors. Patience and positive reinforcement are necessary for training the Mastiff. Harsh training methods are not recommended. Though they often prefer an afternoon on the couch to activity, Mastiffs may enjoy advanced training or agility. Mastiffs have been trained to compete in cart dog competitions, for search and rescue, and as therapy dogs. Agility training or other high-impact activities should wait until the Mastiff has finished growing to prevent serious—and expensive—injury. Though they have a history as hunting dogs, the Mastiff is no longer a common pick as a sporting dog. Mastiffs don't possess enough endurance for the hunt, nor do they have a strong prey drive. What's the difference between an English Mastiff and a Bullmastiff? The Bullmastiff is a cross between the English Mastiff and Bulldog. Mastiffs are calm and laid back, while the Bullmastiff is a more active dog. There are differences in temperament as well—the Bulldog's temperament is more apparent in the Bullmastiff. While there are similarities in appearance between the breeds, the Mastiff is larger than the Bullmastiff and each has distinctive features. Why do Mastiffs eat rocks? Occasionally, a Mastiff may suffer from pica, an eating disorder that causes dogs to eat rocks and stones, clothing, feces (also called coprophagia), and other dangerous non-food items. Pica is not limited to Mastiffs. While puppies may grow out of the behavior, sudden onset pica in adult dogs may be related to malnutrition, thyroid disease, vitamin deficiency, or other health concerns. Behavior-related causes like boredom or anxiety may also be to blame. Do not allow a dog showing signs of pica to chew or eat the items it is drawn to, but do consult your veterinarian, who will recommend the appropriate next steps; these may include a change in diet, an increase in portions, activities to distract the dog from the behavior, or medication. Ingesting non-food items such as stones and clothing can result in dangerous, expensive intestinal blockages or death. Yes, Mastiffs drool—a lot. The pendulous lips and skin around the English Mastiff's mouth make for a drooly canine. Drool happens in anticipation of dinner, with thirst, in hot weather, due to excitement, or 'just because.' Many Mastiff owners keep designated drool towels throughout the house to wipe up the inevitable slimy messes. While drool is a normal part of befriending a large, loose-lipped dog, there is such a thing as too much drool. An increase in drooling may be due to anxiety, upset stomach, or a medical concern that needs veterinary attention.